Project "Roslyn" is a complete renewal of the C# and Visual Basic compilers, exposing them as full fidelity APIs for everyone to use, and providing a great foundation for evolving the tool experience and the languages themselves. 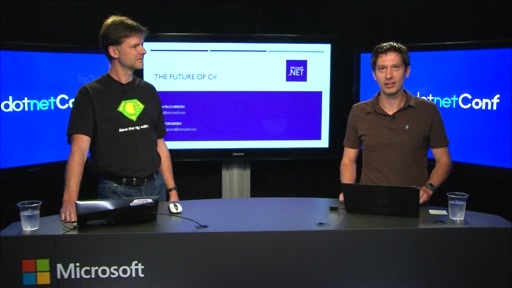 How can you make use of "Roslyn," and what new language features do we have in store? Come and see! I heard there was an interesting article here. Could not find one. I don't watch unknown videos. Very nice, it's kinda scary - the rate C# evolves - at first it was just a simple Java clone and now it's, imho, top language together with Ruby (and compared to Ruby you get enormous performance benefits, also a big fan of static typing). So now we have "Project Roslyn" being renamed to the "The .NET Compiler Platform". Shouldn't it really be called "The C#/VB Compiler Platform"? I mention this because C# and VB are not the only .NET languages available and F# will still remain the most advanced statically typed language on the .NET platform, even after C# 6.0 is released. Implementing C# in C# and VB in VB seems like a huge amount of duplicate effort considering that the gap between C# and VB is reducing. This also most likely indicates that VB STILL isn't going away any time soon, even though it will offer no real differences from C#. Having languages with different paradigms (F#) in addition to C# compiling to the same common IL (and thereby allowing cross-use) is awesome, but to me another language differing only by syntax (VB) is a waste. My preference would be to implement C# in C# and leave VB essentially unchanged for legacy code maintenance. The Roslyn team could have gotten C# out in half the time, or maybe provided us with a Roslyn F# instead! To the comment above, VB is certainly not a waste, at least for those of us who use it to write clean .NET code day in and day out. I use C# as well but I prefer the way VB code reads and how it clearly communicates the developer's intent. Every release or talk of the future comes with a vocal group of C# devotees moaning and complaining about VB like it's the devil. VB exists because there is still a demand for it. .Net has given the developer a choice in syntax and that in my opinion is good. J#, C#, B, C, D (what happend to A? ), Mocha, JScript and similar languages are of less importance to business people like accountants, analysts, economists, and financial engineers. VBA, SQL, DAX, M, VB.NET, VB6 (RAD with C++ performance) are more useful languages to the business world, especially Visual Basic for Applications. Add to that Matlab, R, F#, Python, C++ (for performance), EViews, and perhaps also Troll and SAS and you have a decent toolkit do econometrics, stress testing of banks, build economic models, optimize asset portfolios etc. Of all these languages, Visual Basic for Applications is the most used one. It often acts as the glue between databases, simultion models in e.g. Matlab, and the preferred workspace for most users, i.e. Excel, where the users want their results to end up (much more flexible than a DataGrid in .NET) and perhaps keep different simulation parameters for the models. Why not another language? Well sure, but that would be assembly language to take full advantage of 80 bit precision and AVX-512. And should Microsoft consider to bundle Intel Math Kernel Libray with Visual Studio that would be really great. For that, I would trade inC# any day of the week. "VBA, SQL, DAX, M, VB.NET, VB6 (RAD with C++ performance) are more useful languages to the business world, especially Visual Basic for Applications." True enough. VBA programming and VB6 programming are still widely used, and yet largely ignored by Microsoft. You would think now that Microsoft are sending .Net to the open source wilderness, they would bring back VB6 programming. VB6 and VBA programming are the most useful business languages. Have a look at Delphi XE8. Okay before knocking it down have a look at the features with an open mind. I did and it is very powerful and rich. But dont take my word, make your own experiences. Support Statement for Visual Basic 6.0 on Windows Vista, Windows Server 2008, Windows 7, Windows 8 and Windows 8.1, Windows Server 2012, Windows 10, and Windows Server 2016. The Visual Basic team’s goal is that Visual Basic 6.0 applications continue to run on supported Windows versions. As detailed in this document, the core Visual Basic 6.0 runtime will be supported for the full lifetime of supported Windows versions, which is five years of mainstream support followed by five years of extended support.